Could an app be the “silver bullet” to shoot down the high cost of health care? 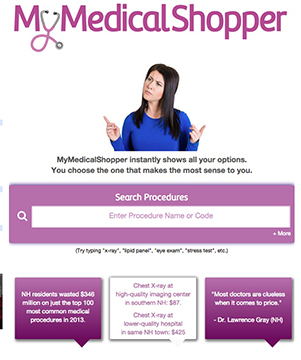 Mark Galvin thinks his smartphone app, MyMedicalShopper, is. Launched by MMS Analytics Inc., it's the latest company spawned by the serial entrepreneur and founder of the New England Innovation Center in Portsmouth, where the company is located. Galvin boasts employers will be willing to invest $5 to $10 per employee per month for a health cost transparency tool that would allow a 75 percent cost savings on some 4,000 medical procedures. The genesis of the application – which Galvin calls the “Gas Buddy of health care” – was his own personal frustration in dealing with cost transparency a decade ago, when he started up Whaleback Systems, a subscription-based broadband voice and communication for small businesses, his fourth high-tech startup. He had to fully provide health care benefits – talented software engineers are among the few that still expect it – but this time he wanted to try another way: a high-deductible policy combined with a fully funded health savings account. These tax deductible accounts, unlike flex spending accounts, allow employees to keep whatever they don’t spend for future medical needs, or perhaps be rolled over into a retirement account. After several attempts at pushing transparency legislation in Concord, as well as several run-ins with the medical and insurance establishment, Galvin’s frustration grew. While there are some transparency tools out there – including one by the state of New Hampshire – they only give the costs of a limited number of tests, and don’t include the cost deals brokered by various insurance companies – nor what the consumer actually pays, given their particular health plan. Besides, he got a bit sidetracked founding and running the New Hampshire Innovation Commercialization Center, a high-tech nonprofit, in conjunction with the University of New Hampshire. Galvin went on to start the New England Innovation Center LLC, a for-profit version of the ICD, and pitched his cost transparency idea to Matt Robinson, a partner in the center and its technology director. Galvin reasoned they could use the claims data that insurance companies must file with the state to find out the true cost of procedures to the company and the consumer. That may be 14 million records in New Hampshire alone, but with strides in computer power, the falling cost of servers and the growth of smartphones, all this could be accomplished at an affordable price, they reasoned. Galvin also said that doctors don’t know the cost of procedures either. He gave the example of when his doctor ordered a nuclear stress test for his heart. Galvin whipped out his newly developed app, and even in beta mode it revealed that a test that cost $6,500 at the hospital would only cost $1,450 at Derry Imaging, which was even closer to his house. Even the lower-cost option was an eye-opener for the doctor, who, after considering the risk factors, suggested that Galvin could really skip it. Galvin will eventually make the app available to individual consumers, but for now he is going though insurance brokers to reach employers. In November, he is working with those with Anthem policies, and in December it will be available to those with Harvard Pilgrim coverage, with more carriers to be included later. Galvin has certainly won over Tom Harte, president of Landmark Benefits in Hampstead and immediate past president of the National Association of Health Underwriters. Harte said his clients are excited about the application and so is he.